Almost exactly two years ago, I wrote about an occurrence of the Baader-Meinhof effect. A couple of months later, I wrote about some other interesting things that I wanted to categorize under the heading of a phenomenon, but I was struggling to find a name. Then, last summer, Baader-Meinhof, or something very similar popped back into my world. Perhaps not a real occurrence, but one of those weird things that happens and you don’t know whether to just shake your head, or if it’s something you should wonder about. If you haven’t guessed, this has happened again. 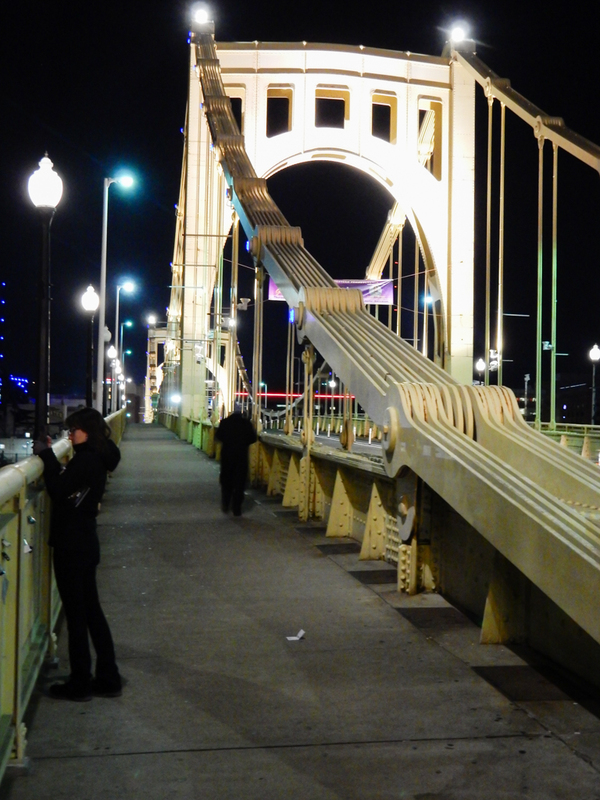 When we were visiting Pittsburgh in November, our daughter and I walked along the Allegheny river waterfront on our way to the Strip District. We crossed the Robert Clemente Bridge, walked under the Andy Warhol Bridge and also walked under the “other sister” the one I never remember. You know that feeling when you know you know something but you can’t remember it. It nags at you, and you know that as soon as you stop thinking about it, you’ll remember it. A few blocks after my daughter asked “what bridge is that?” and I sighed and stuttered “some famous woman” it came to me: “Rachel, it’s the Rachel Somebody Bridge” – A few more steps and the whole memory shook itself loose of the cobwebs. It’s the Rachel Carson Bridge a.k.a. the 9th Street bridge, a.k.a. the third sister but the only sister who’s named after a woman. Technically, I wasn’t wrong; she was an author. She was also a scientist who’s credited with advancing the global environmental movement. That had to be no small task in Pittsburgh in the 1950s when powerful industrial forces would probably have preferred to continue to have Pittsburgh be known by its nickname “Hell with the lid off”. Actually, Rachel worked more to fight the widespread use of pesticides, and her book “Silent Spring” ultimately led to a nationwide ban on DDT as well as other chemicals. I returned from Pittsburgh with Rachel Carson, author, firmly planted in my active memory. Then, I began to see ads for a documentary on PBS which premiers this month. (It’s on tomorrow night). It was while watching that ad that I realized that she was more scientist and activist than author. When I searched for her, I discovered that PBS had aired an earlier special by Bill Moyers in 2007. The truly weird part was when, early last week, a friend on Twitter posted a link to a book, “Always, Rachel” about the letters between Rachel Carson and Dorothy Freeman. The book isn’t new; it was published in 1995. I knew about the book Silent Spring, but I was 8 years old when it was published. I remember the ban on DDT, the Clean Water Act and the Clean Air Act, and I remember many people in Pittsburgh complaining that those laws would ultimately cause the city to lose many good jobs. I also remember wading in the waters of Lake Erie when you had to brush through pods of dead fish in order to get to “cleaner” water to swim in. And, I remember my brother coming home from an afternoon of water skiing on the Monongahela River and being able to pull his cut-off blue jean shorts apart with his fingertips after a cycle in the washing machine. As for the bridges, I’ve always loved the Three Sisters because of their unique design. I didn’t know about their “new” names until I visited the city in 2009. The 6th St bridge was renamed on August 6, 1998, as part of a compromise after the Pirates sold the naming rights to what became PNC Park. There had been a large movement to name the park after Roberto Clemente. The 7th St bridge was renamed for Andy Warhol on March 18, 2005, as part of a tenth anniversary celebration for the nearby Andy Warhol Museum. The 9th St bridge was renamed on Earth Day, April 22, 2006, after a lobbying effort by Esther Barazzone, president of Chatham University, formerly Chatham College, formerly Pennsylvania College for Women. Rachel Carson graduated from Chatham. I’m not sure why these coincidental encounters with Rachel are occurring. Maybe it’s just a good time to remember how important women are. I am proud of the contributions she made, and even though it took a lot of lobbying, I am proud of my hometown for honoring such an important woman of science. Note: Not only does my lovely editor own a copy of The Mystery of Edwin Drood, she owns a couple Rachel Carson books and was surprised by my ignorance on the subject of this remarkable woman. Sorry about the photo overload, but I like them all and my battery is dying. The Three Sisters, Rachel is in the foreground. I’m first? That’s a first! :) Happy Monday, Dan. I love this post because it’s full of bridges! … and although I’ve never heard of the Baader-Meinhof effect, I certainly know when it happens to me. It makes me sit up and take notice. I hadn’t realized that Silent Spring was that old. I was thinking more 60s, even 70s. Women have played a huge role in being the conscience of the world and fighting for changes that make the world a better and safer place. I didn’t know about Rachel Carson, but now I do and am grateful for her efforts. Thanks Joanne. I think Silent Spring was published in the early 60s. I may have done the math wrong, I might have been 8. Women have, and continue to play a huge role. Often overlooked or undervalued. I do love bridges. Joanne said it well about the positive and impactful role women have played. I did not know about Rachel Carson, so thanks for a little of her history and achievements and the pretty bridge photos. Nice way to start off a Monday morning. Thanks Mary. I am going to try to learn more about her. She brought about a lot of change. It must have been very hard for a woman to do at that time. It’s sad that times haven’t improved more than they have. Her book changed my young life (being just a little bit older than Dan) so that I was aware of what might be happening in my own ocean! Such an interesting post, and interesting woman. Thank you for bringing Rachel to our attention … the universe does work in mysterious ways. Its a good time to appreciate women and the environment! Thanks Val. I am always caught in the light when these occurrences happen. It did seem like a good time to draw some attention to a woman of science who hard work made such a difference. Welcome aboard – actually, my grandmother was named Rachel, too. Bridges are wonderful pieces of architecture that always make me aware of the various crafts who create them to last so generations can pass over them. Nice shots. :-) But, the big question this Monday is how are you doing after the game last night? My husband was smiling, but I knew you weren’t. Let’s stick with the bridges, Judy. I am disappointed, but we didn’t take our best game to Boston and you can’t win up there unless you are playing at your highest level. I’m proud of my team, and I’ll be there to support them next year…as always. These bridges, by the way, were the only self-anchored suspension bridges at the time they were built. They are very interesting structures. what a fantastic post = and the warhol bridge is my fav – but o much to enjoy and learn about. Thanks Yvette. Maybe I appeal to morning people. In any case, I appreciate their support. I’m glad you liked this post. Silent Spring was required read for incoming Freshmen when I was in high school so this post brought back memories. Baader-Meinhof…every time I talk about this, I can never remember what it’s called. Your post about it was when I first realized it actually had a name! Very cool post, Dan. Carl Jung called it synchronicity… I pay attention when it happens. I figure the Universe is trying to get my attention! Then I guess the universe is telling me that I should pay more attention to women. Not a bad message these days. Thanks Lois. I may have actually read Silent Spring, but I don’t remember. I took some courses in high school where the teacher would have been likely to have us read a book like that. I always have to search my blog for Edwin Drood to fine Baader-Meinhof, as if Edwin Drood is easier to remember. Wonderful post and pictures, as always. I had to delete my WordPress from my phone, because my WordPress on my laptop was acting wonky. Now, since I said it, maybe I’ll run across fixes for that several times this week. Hey, worth a try! Thanks for the additional information on Rachel Carson. I thought she was a writer who knew some science; never knew she was a scientist who could write compellingly. I wish I had more thumbs, but you’ll have to settle for a mere two thumbs up! Thanks Marian. I am looking forward to learning a bit more about her. I hope WordPress unwonkafies itself in the near future. The phone app is driving me crazy. I didn’t know the “effect” had a name. Thanks for that tidbit. I had heard of Rachel Carson but haven’t read the book – perhaps it’s time, eh? Thanks Maggie – I’m thinking it’s time to read, or perhaps reread (I may have forgotten) that book. I can’t speak to PBS airing a documentary after you crossed a bridge named for Rachel Carson but there is something more to it than the Baader-Meinhof phenomenon. The media is so click-happy that anything which causes a wave of attention will quickly be amplified into absurdity. I don’t know, I didn’t mention this on Twitter, or anywhere, although I did search for it. Still, not sure how that could motivate a friend to read/recommend a 10-yr-old book. In any case, I’ll try to watch the documentary. Yeah, it probably doesn’t work on the personal level but the flap of a butterfly wing in the media on Tuesday will yield a hurricane on Wednesday. I was speaking more to that. Enjoyed this. I always love visiting your city and your pictures make me smile. I wish there could be a fourth sister, so there would be a Billy Strayhorn Bridge. Of all the illustrious people to come out of Pittsburgh, he is my favorite–a talented and extraordinarily kind man. Thanks, Dan. I am glad you enjoyed this. I love taking pictures whenever I visit the city, which is about every other year now. Pittsburgh has over 400 bridges, you’d think they could name one after him. I love bridges especially the night photographs of it. Thanks. I took so many photos, I was having trouble narrowing the list. I had taken my laptop with me to my daughters (to watch that God-awful AFC playoff game) and the battery was almost dead. Time to upload and add captions, but I had to stop sorting. Clearly this is an interesting stream of consciousness piece, your thoughts flowing like the river — a nice, clean river :) I love the pics, especially the love locks and the bridge(s) at night! I know nothing about Ms Rachel Carson, but I have read The Sea Around Us. Love the bridges, but more importantly the background of Rachel Carson as I remember the environmental issues you mention especially banning of DDT…coming from the farm belt….in a good sense we have come a long way in environmental issues…but clearly still have a long road ahead of us! Great post, sir!! Thanks Kirt. I don’t imagine the banning of DDT was taken too well in the farm belt. I had a lot of extended family that complained about the pollution controls hurting Pittsburgh industry, but the air and water were so bad, even after they started trying to clean up their act. I do remember that time frame….what a change for Pittsburgh!! Have to read more about this Baader Meinhoff effect. I think I commented this before, but when I was still working in Nursing I would often get repeated cases of the same diagnosis, clustering together. Interesting about the polution being so bad that it killed fish and disintegrated your brother’s shorts. Yikes. Just shows pollution is not just a figment of our imaginations. Love Rachel Carson. Yes she had a great impact. I remember how DDT just about wiped out California Pelicans. The chemical, from runoff of farms into the water, was found to weaken the shells of the pelican eggs so that they would collapse. Now since the ban on DDT the pelicans have recovered. Baader-Meinhof appears and reappears from time to time with me. It’s always an odd thing, but it usually causes me to dig into some research and I usually feel better having done that. I member reading about the weakened egg shells being caused by the runoff. It took a lot to get that chemical (and others) banned. Thanks Christine. These things have a way of weaving themselves into a story. It seemed like a good time to feature a smart, powerful woman, especially one who was controversial and yet helped prevent a damage. Love the picture of you guys walking to the game. Very cool bridge. Women in all ways are inspiring, Rachel, as well. What a nice read. Your lovely editor deserves a raise and a beer, I think. Oh, I bet she knows how much they get paid. Love offers opportunities where women choose to ignore the fine print, because y’all are just far too worth it. Plus, now that people know she’s back there, she gets blamed for mistakes. I always announce in an early comment, when I post without her review. Thanks. I find some things hard to ignore. I liked the bridges and details in their names, history of name changes and the beauty in your photos, Dan. In 2012, I visited the beach where we used to vacation. I was very happy to see how clean the water was, although the amount of erosion was a little scary. So glad the water was cleaner when you came back to your old, favorite beach, Dan! Yay! Wow. Much connection in your experience. This happens to me quite frequently. As a side note, shortly after I started my new job here 6 mos ago, another woman came on board who has become the dear friend I had been praying for, just someone you can totally be yourself with, that is also honest and has your back-and allows you to do the same. Her name? Why Rachel of course. And ther is always the Bible’s Rachel……😉Perhaps we need to turn our thoughts to bridge building in whatever way possible to ensure a healthier, brighter future thatn the one that seems to be looming.. have a great week Dan! Love your photos. Thanks Cheryl. I’m glad you found a good friend. Maybe it’s just a good time to be a Rachel. Books with such powerful messages should always be honored. I wish I could write like she did. Especially given the science involved. I always struggle when trying to put science in a readable form. Thanks Amy. These things, coincidence, connections, messages…I don’t know, but they always make me take notice. I did watch the PBS special on Rachel. Interesting and sad in many ways. She was a very special woman, and she carried a heavy burden. If they repeat the special (which they always do) you should check it out. What a great post, Dan. Thank you. I love bridges, especially when they have a story. Rachel Carson, you were awesome! My favorite bridges span the Merritt Parkway in Connecticut. I am in awe every drive. Each Art Deco style bridge is different, and a work of art. The one that has Winged Victory…makes my heart beat. Thanks Jennie. The bridges on the Merritt are very special. I don’t like driving on that road, but I do like seeing them. This was as interesting as the Thursday Doors. Loved the pictures that compliment the content. The first thing that comes to my mind on hearing the word Rachel is Rachel McAdams, one of my favorite actresses. These days I’m watching Oscar nominations movies. Saw Manchester by the Sea the other night. Loved it. Are you into movies? I don’t watch a lot of movies. My mind wanders. By the way, how’s your hand? Fingers I mean. That was not a good visual to see. I am hyper sensitive so I get worried quickly. The hand is fine. That injury happened several years ago. There are some lingering issues, but they are minor. Oh, I thought it is a recent picture. I was going to message you on FB Messenger, but then I realized you might be in office or something. I’m a bit overprotective for my loved ones. Thanks Evelyne. I watched the PBS documentary and they covered her life in Maine very well. I have not been to that area, but I think I’ll check it out during the next road trip to Maine. Hey dan – had to come back now that i have a little more time. I love when this happens to me – and a theme unfolds in my life – which is what happened with Rachel. so cool. also – I have heard of silent spring – but had no idea of who was behind it. and side note – did you know that the restrictions on some pesticides – like in hotels – has led to the resurgence of bedbugs and maybe other diseases that are transmitted by mites and critters. A while back I was reading something very meaty about it. It has been with me since. Thanks for coming back, Yvette. There’s always a trade-off with these things. At least now, we seem to be doing a little more up-front research and testing. I’m not a fan of bed bugs, but I’m glad I’m not sleeping in DDT when I travel. I have a hard enough time dealing with the often over-use of Fabreeze. well I hear ya – and FeBreeze kills birds and is very bad. Have you ever heard of Diatomaceous earth? well we travel with baggies of it and lightly sprinkle it around the beds and floors – not breathing it in and it is also great for facials and so many things – especially pet care. It is ground diatoms and is quite a gift. I also bring this 8 dollar essential oil diffuser – and plug that in – Dan – they work so well in hotel rooms because the essential oils are all natural plant oils so they make the air healing and smell nice – and can kill mites and deter stuff. I think Marshalls or TJMaxx was where we found our travel diffusers – worth so much to me. well we first heard about it from some folks who had a Rottweiler Rescue…. they used it for the dogs. but they never sold me on it and so I stayed away – but finally decided to try it! I do know of the terrorist gang, but I’m not sure they are the original. I don’t know when the phenomenon was identified. In any case, no, not the gang, that thing when you hear something new, and then hear it multiple times. Thanks for dropping by and taking the time to comment, Val. I’m glad you got a chuckle.